We got to hold a juvenile alligator during our swamp tour. First let me set your mind at ease, we were only hunting alligators with our eyes and our cameras (though we did eat some alligator bisque while in New Orleans). While most activities in New Orleans center on history, culture, and cuisine, the city provides a unique opportunity for travelers to experience nature as well on a New Orleans swamp tour. The Louisiana swamps and bayous, just a short drive from New Orleans, give visitors the chance to take a boat ride and see swamp animals and plants in the great outdoors. A canal through the Jean Lafitte National Park and Preserve. We took our swamp and bayou tour through the Jean Lafitte National Park and Preserve. The park is named for Jean Lafitte, a pirate in the Gulf of Mexico in the early 1800s. 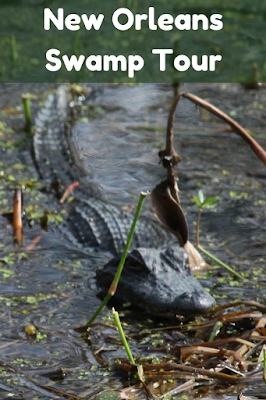 Jean Lafitte Swamp & Airboat Tours is the only company in Louisiana that can guide guests through the national park. We joined one of their tours through Gray Line Tours New Orleans. There are lots of gators on a New Orleans swamp tour. Tours travel through the Louisiana swamp on special swamp boats, traveling through canals and bayous. The canal, a straight waterway built for oil drilling and logging, joins the Bayou Aux Carpes. Bayou means slow moving water, and the bayous are natural waterways that bend and turn through the swamp, bordered by bald cypress draped in cascading Spanish moss and the occasional mistletoe. Turtles hanging out in the Louisiana swamp. The swamp is teaming with wildlife. 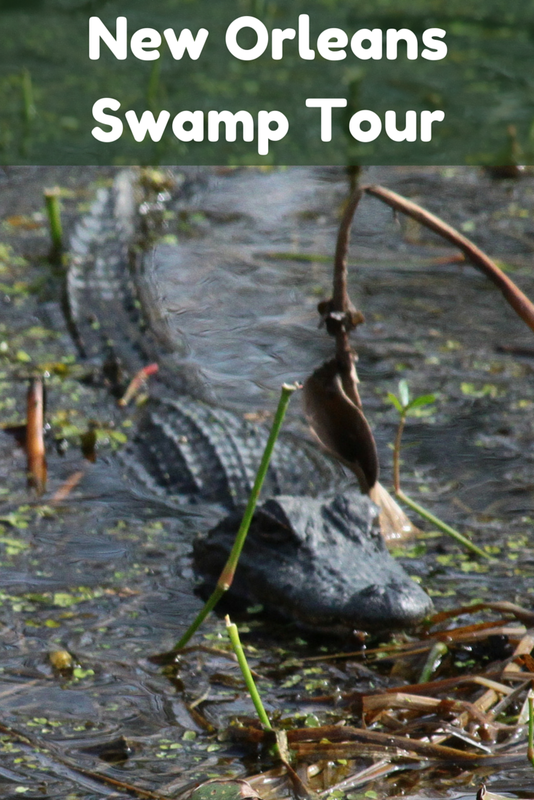 During a swamp tour, in addition to alligators, you might encounter white-tailed deer, armadillos, nutria, turtles (including snapping turtles which also appear on New Orleans menus), blue herons, black vultures, and perhaps even a bald eagle. There are also 50 species of snakes in the swamps, seven of which are venomous. There are many animals in the Louisiana swamps, but let's face it, what you really want to see is alligators! During our swamp tour we saw one armadillo, one great blue heron, one bald eagle, two black vultures, and a number of turtles and alligators, and that was in December. While alligators are more active in the summer when the water is warm, you can expect to see them all year round. As alligators are cold blooded, they are the temperature of the water. Therefore, in the winter when the water is cold, it’s just a little harder to find them as they are buried in the banks, stationary amongst the foliage, but the expert guides know where and how to find them. Around April the alligators move to the banks to sun and in the summer they are swimming around in the 85 degree water. They're a little harder to spot in the winter, but you'll still find alligators. While traveling through the swamp waters you’ll learn interesting facts about the flora and fauna of the swamps and bayous. For instance, great blue herons eat alligators when they’ve just hatched. Also, the Florida and Texas records for longest alligators are both 14 feet three inches. The Louisiana record is supposedly 19 feet, but it can’t be proven because the guy who caught it said it was too long to bring in so he measured it with his rifle and left it behind. The Louisiana swamps are covered in green, even in the middle of winter. Animals and plants aren’t the only things to be seen during a Louisiana swamp tour. We passed a replica of a nutria trapper’s cabin and another shack built along the bayou that has been used as a filming set for movies and television shows. The Jean Lafitte National Park and Preserve has been featured in TV shows and films. Near the end of the tour everyone on the boat got to hold a live alligator. Alligators are protected so it is illegal to feed or handle the alligators in the swamp or have them as pets, but the tour company has an educational permit so they can keep small alligators for visitors to view and handle. The alligator we held was a small three-year-old with cold smooth skin. It’s quite an experience to hold something so small that you know will someday be huge, powerful, and kind of scary. Canals and bayous wind through the Louisiana swamps. A trip to New Orleans just isn’t quite complete without a tour through the swamps of Louisiana. Nothing says well-rounded vacation more than a historic city, phenomenal food, killer drinks, scintillating music, and a side of swampy alligator. Come see me in the Louisiana swamp!